One of Pelosi’s first acts as Speaker of the House will be an attempt to repeal what was once called the Mexico City policy, a directive prohibiting the Department of State from funding nongovernmental organizations that “perform or actively promote abortion as a method of family planning.” She quietly slipped the repeal into a bill to end the shutdown. Washingtonexaminer.com reports: This shows exactly what kind of speaker Pelosi will be. When President Trump negotiates with Pelosi, he will be sparring with a shrewd negotiator and a champion of the abortion industry. 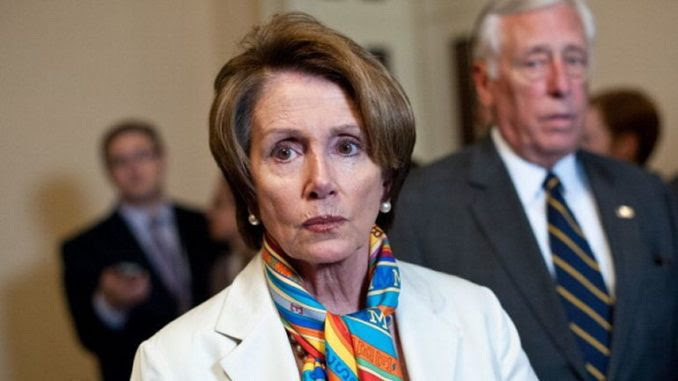 Now, Pelosi wants to expand the abortion franchise. As the Washington Examiner’s Kimberly Leonard reports, the spending bill in question would end the shutdown and increase funding by $5 million to the United Nations Population Fund to $37.5 million. It’s the definition of a poison pill. Although never committed to the cause before he ran for office, Trump is arguably the most pro-life president if judged solely by results. He expanded the Mexico City policy. He was the first president to address the national March for Life in person. He nominated two ostensibly pro-life Supreme Court justices. Call it a return on investment. Trump made a deal with evangelical voters during the election, and so far, he’s keeping his end of the deal. Now, the two could be put in conflict. Eventually, a deal has to be made to reopen the government, and when that occurs, Pelosi could hold funding for border security hostage to money for overseas abortions. Don’t put it past her — she has shown exactly who she plans to be during her second stint as speaker.